SIMON BROWN gets overwhelmed with extravagant oddness at the Munich High End Show, and follows it up with a dessert of Hong Kong proportions. 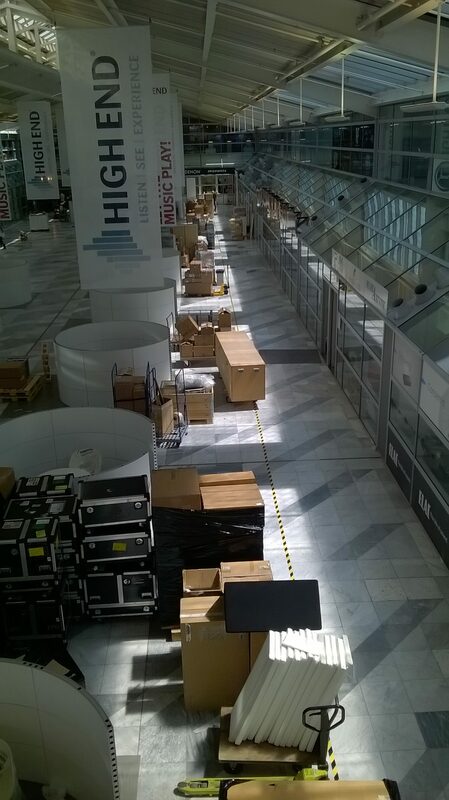 “Take lots of photos,” said a friend as I left for the Munich High End Show. I failed. 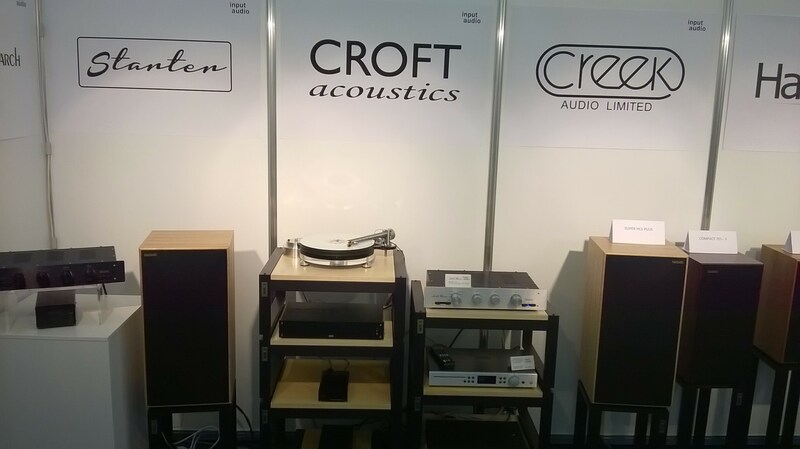 This year I was helping to staff the stand of German distributor Input Audio, who sell my The Wand Tonearm, as well as a bunch of ‘English- speaking’ brands. 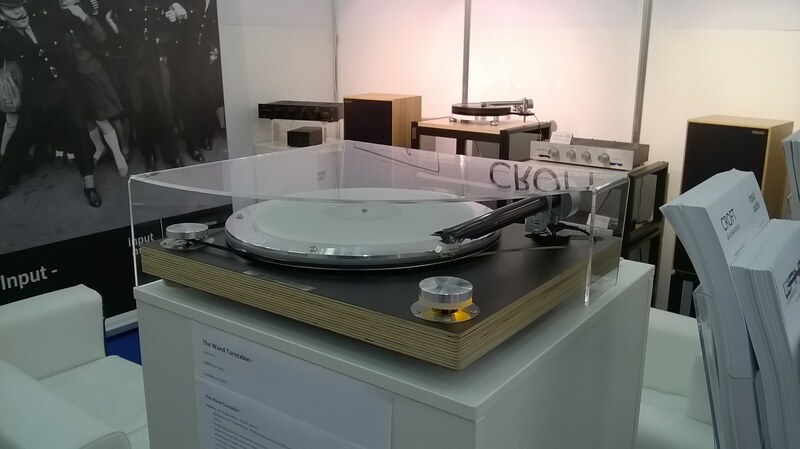 I was also showing a prototype Wand Turntable. It was a great show, but most of my photos focused around the area in the main Hall within the range where you could nick off to explore when there was a quiet moment. Fortunately, Paul Quilter of PQ Imports was there too, and did a great job on the photo front. [Click here to see those]. I found it interesting being there on one of the setup days. 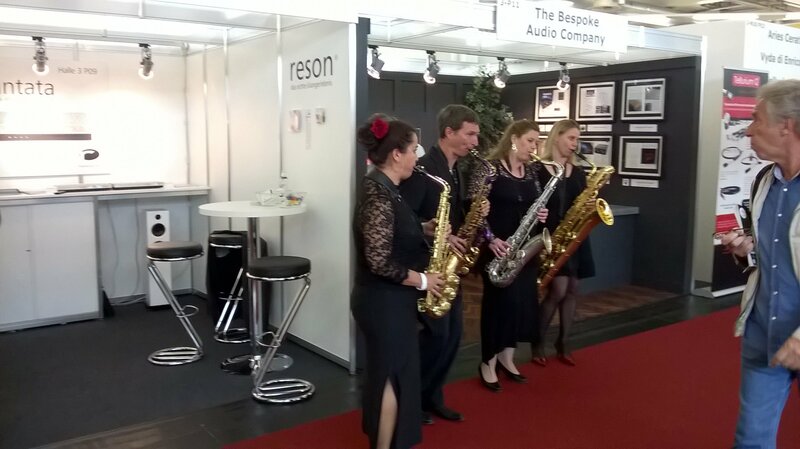 It is easy to go to a trade show and just see all the gear nicely set upon tidy stands. But the logistics of shipping it all in, setting it up and getting it functioning, complete with lighting and hidden wiring are considerable. It was pretty chaotic, at least by German standards. There must have been many stories of gear damaged, going missing or simply late. The other thing that was noticeable to me – having attended the show as a visitor two years ago – was how 90 per cent of the exhibitors are in the same positions, which simplifies things for exploring but leads to the danger of thinking there is nothing new. 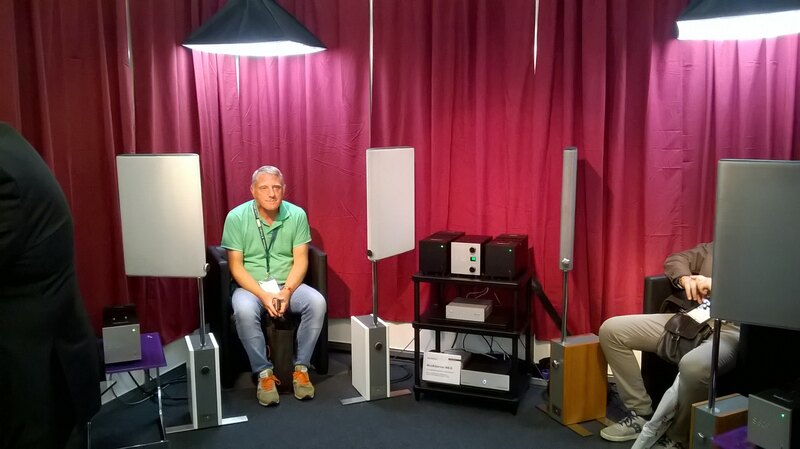 From hearsay, it sounds like new exhibitors can end up with some pretty unfavourable spots, and I chatted to an Australian speaker manufacturer who was suffering from exhibiting their techie speakers in a shoebox with the small end open. To provide a sense of scale, the Munich High End Show had 538 exhibitors this year, up 2 per cent on last year. Around three-quarters of these are in three big halls which are mostly open stands. Some of the major brands like ProJect have huge areas (50m x50m) while the smallest are less than 3m x 3m. Because of the open nature of these stands, you aren’t supposed to play music more than very quietly. It is possible to hire sound cabins that let you trap your victims and subject them to very loud pointless drumming tracks, however! Impressively, neither the drumming nor the screams of those inside can be heard outside. The scantily clad girls employed to open (or hold shut?) the door on one of these near us should have been a clue that this wasn’t going to be a subtle system. I was impressed by the guy sitting next to me who stuck his hand up after about 20 seconds and said: “Can we have some music now?” They then struggled to find any, seriously. Actually, this brings up the dilemma for exhibitors of what to play. I am guessing that we might have been the only people playing Fat Freddy’s Drop! There is a valid criticism of hi-fi shows that they play too much mushy jazz and 1970s progressive rock. Yet you want to draw people in, interest them. At the end of the day, you just have to play a mixture. 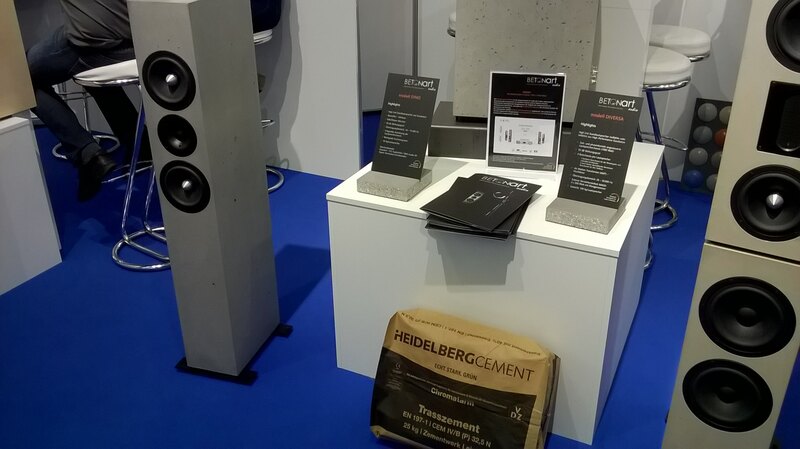 We were guilty of playing our own version of drum stuff in the form of Charlie Antolini’s direct-to-disc recording ‘Knock Out’, which we cranked up in the last hours of the show, the Harbeth HL5s impressing me as much as the visitors, if not the neighbours! 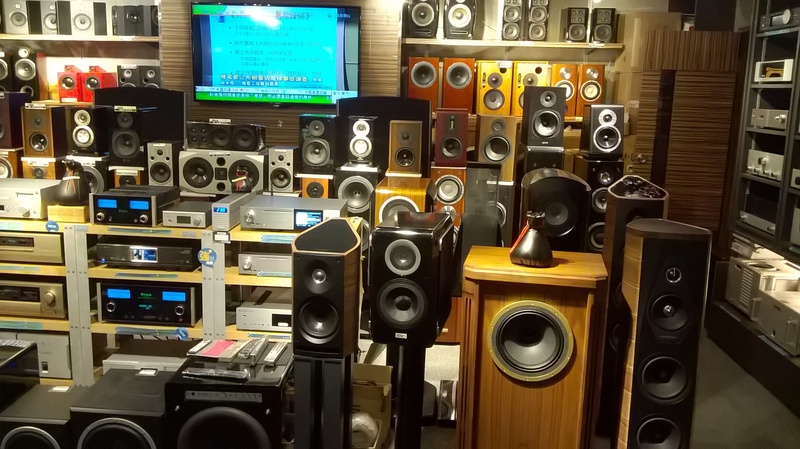 I am really glad I don’t make loudspeakers, such is the profusion of everything in speaker design. 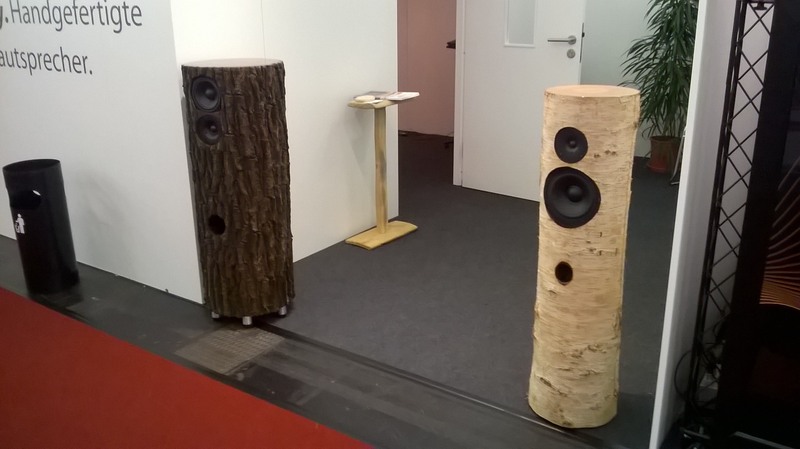 There were concrete speakers, speakers that looked like tree trunks, speakers that were painted with flowers, speakers that looked like giant speaker drivers, boxy speakers and boxless speakers. 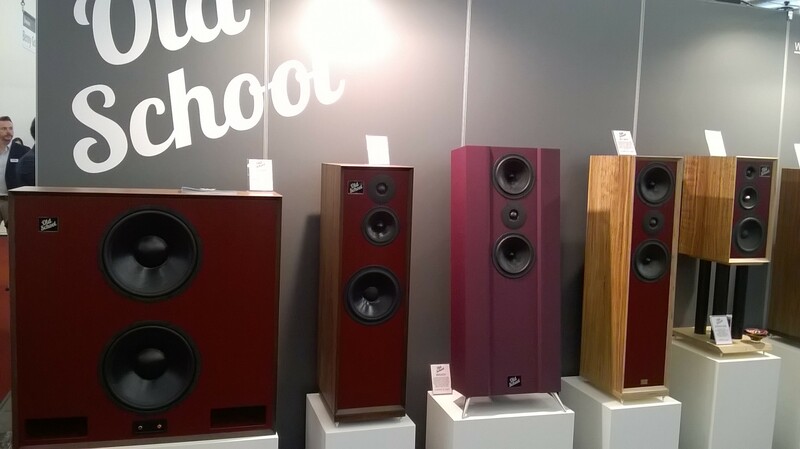 As for solid ply or insanely curvy speakers, common as muck! That there was a speaker maker called Old School was symptomatic of one of the themes of the show: gear styled in ‘retro’ mode. JBL must have a company DeLorean time machine to take them back to the 1970s, as they showed a model with white paper cones and their 1970s ‘blue front’ colour. My visiting wasn’t scientific (especially with my vinyl interest) but I would say that last time there was big excitement around reel to reel, now they were just there. Vinyl remains strong and CDs had by no means disappeared. Looking at stopovers on the way back from Munich, I chose Hong Kong, having never been there and keen to look at the audio scene. I was very lucky in having Michael, a local friend, to show me around. Local knowledge is pretty essential, as only one of the shops we went to had a shop-front in the NZ sense (and that was stairs to a basement). This simply reflects having nearly twice the population of NZ occupying the space of one of the smaller NZ cities. The poshest dealers are in central Hong Kong, but many are very discreet; the only clue the audio tourist being a small plaque in a building tenant list, which mostly features expensive doctors. No room here for neon signs and manufacturers’ banners. We were even vetted by a concierge before being guided to the lift. Smoothly whisked upwards, the doors opened and I could tell this wasn’t K-Mart. A good proportion of the best Munich gear was represented, including the likes of Goldmund, Wilson and Burmester. We visited a number of similar shops occupying more floors of this building, all with elegant interior design and spacious showrooms (space = luxury here). A swift MTR underground ride under the harbour to Mong Kok was also a welcome respite from the 30C humidity. Emerging from the escalator from the E2 exit on our left was a lift lobby where a few hi-fi posters jostled with the Body Shop on one side. The format here was that each of the half a dozen stores we visited occupied a floor each in the building. All were medium to middling high end, although one of them didn’t seen any incongruity in selling vacuum cleaners at the same time, presumably using the logic that they were ‘high-end’ Dyson suckers. 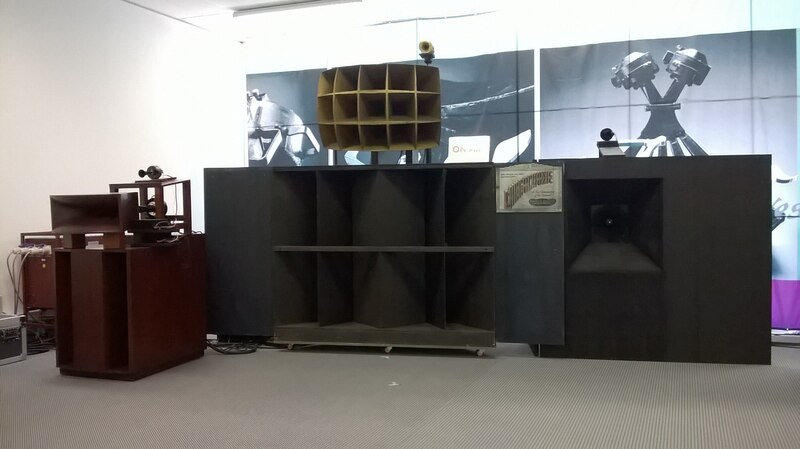 Having a local audio guide was great, along with his observation that one shop with a dozen turntables a year back had only one. Heavyweight chrome plated German turntables (and amplifiers) were favoured, but classic items are very hot too. 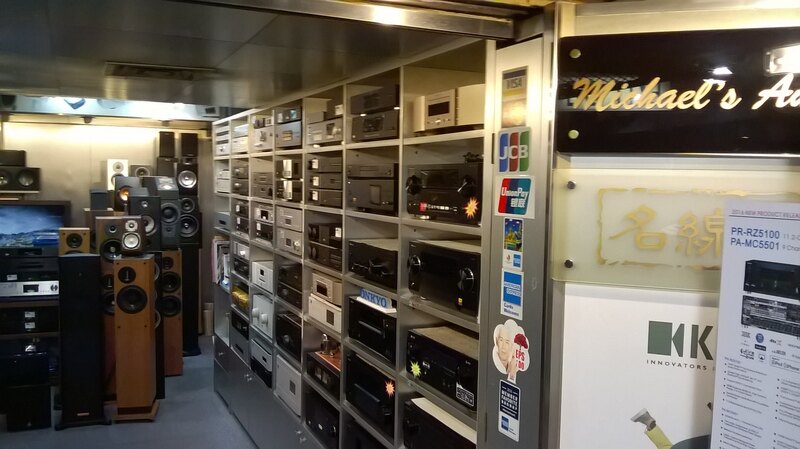 These stores tended to have demo rooms where the better gear resided, while the mid-fi stuff was squeezed in. Lunch was conquered at a great Yum Cha restaurant with 100-plus tables hidden to my Kiwi eyes in a multistory building, and then it was off to see some good record stores in the Mong Kok area, where it was good to see some of the older Chinese LPs being re-discovered and treasured by the locals. Interestingly, the world is changing again and the exchange rate means that it felt like Hong Kong prices were pretty comparable with NZ. Not too many obvious bargains to be had. 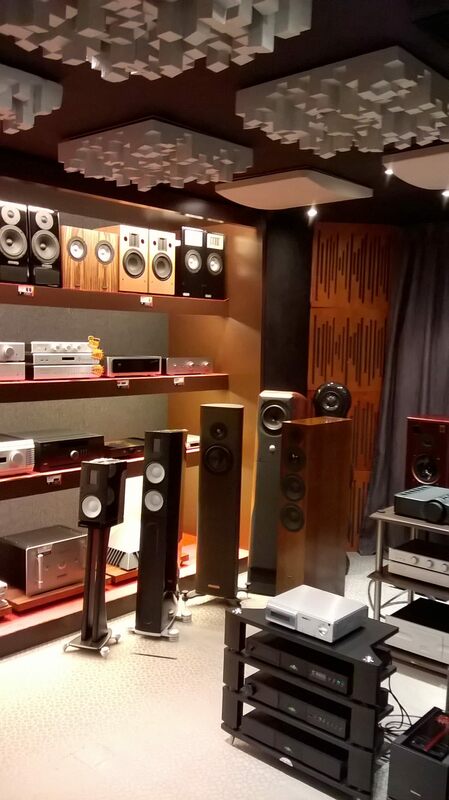 Although business in the lower hi-fi sector is cut-throat, margins are very low. I didn’t visit any second hand places, but suspect that a lot of the high end gear gets moved on. Michael pointed out that some of the opportunities for the canny are in the new wave of Chinese audio makers who are making some good gear but not well represented in English speaking countries yet. 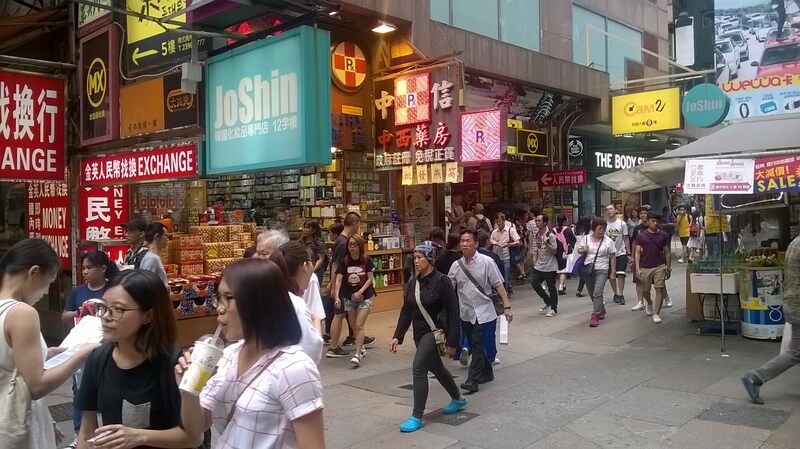 I really enjoyed Hong Kong. It was like Wellington on MSG: steeper, taller, busier and with added flavor. The audio scene was a microcosm of this. Audio tourists are probably best to research on-line before they go, but could have a great time and get some great gear!